Young cornflower seedlings can tolerate freezing temperatures, so seeds can be planted in early spring, or in the fall where winters are mild. Wheat, Oats and Crimson Clover. Cornflowers have an upright posture that helps them fit in tight spaces. Intersperse throughout the garden, as cornflower nectar is unusually sweet, and thus a preferred food source for many beneficial insects. 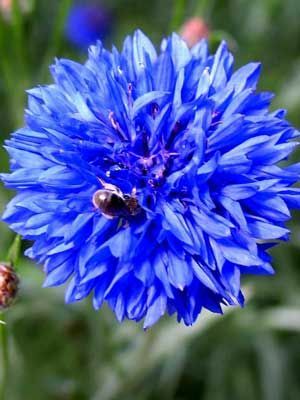 Sow cornflowers from early to mid spring for early summer bloom. Also sow in fall in climates with mild winters. Plant seeds in soil or in containers about 2 inches (5 cm) apart and one-half inch (1 cm) deep. Thin to 8 inches (20 cm) apart in all directions. Rice-size cornflower seeds are much loved by goldfinches and other small seed-eating birds. Cornflowers make good cut flowers. Pull up the plants in mid to late summer, when they no longer look attractive. Cornflowers may be nibbled by rabbits, especially in early spring when other food is scarce.